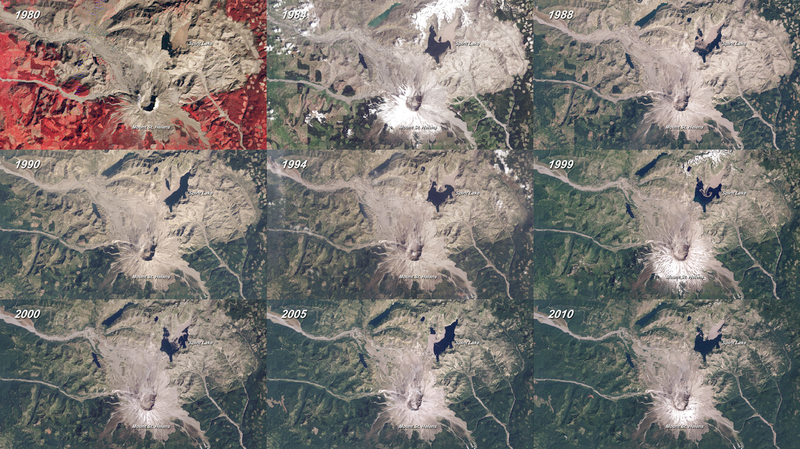 Landsat Imagery of Mount St. Helens blast zone from 1980 – 2010 from NASA. We’re heading to the Pacific Northwest for this week’s throwback Thursday (#TBT) to check out the changes on and around Mount St. Helens over the years. The 1980 eruption certainly wasn’t the largest or deadliest eruption in recorded history, but it may be one of the most thoroughly researched. For over 30+ years, scientists have been exploring how the landscape recovers from such a catastrophic event. But it may surprise you that there’s an even bigger transformation going on in national forests around this infamous stratovolcano. All around the mountain, logging companies have been clearcutting large tracts of the national forests for timber. If you look at this map of global forest cover from the University of Maryland, you will see a checkerboard of growth, loss, and a mix of both. But keep in mind, the areas that show gain are not necessarily diverse, old-growth forests, they are most likely a monoculture crop grown over decades instead of months. 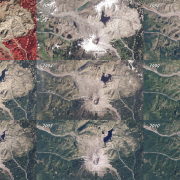 The google-powered Timelapse below allows you to view the landscape changes around Mount St. Helens from 1984 to 2012 (the eruption occurred in 1980). After you explore the Timelapse, you can also check out the Global Forest Watch to see exactly how the forests have changed over the past 12 years. Interested in what you see from our Timelapse investigations? Do some of your own and share your findings with us on Facebook or Twitter! 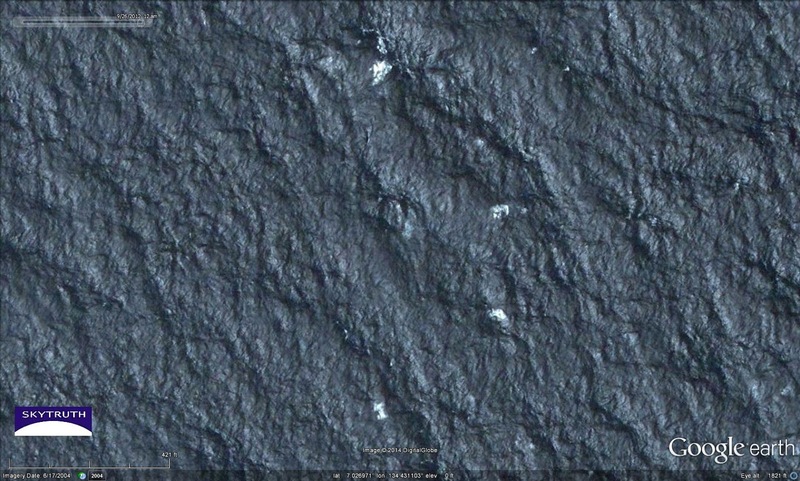 Today I was looking at high-resolution satellite images of the ocean and ran across something that reminded me of the search for the still-missing Malaysian Airlines flight MH370. You might recall that several nations published satellite images that supposedly showed hundreds of pieces of floating debris in the Indian Ocean. Twice I was booked by CNN to appear on the Jake Tapper show to talk about what we thought of this imagery; both times they canceled. Maybe in part because I couldn’t be very confident about what I was seeing, and that’s exactly what I told the producers. 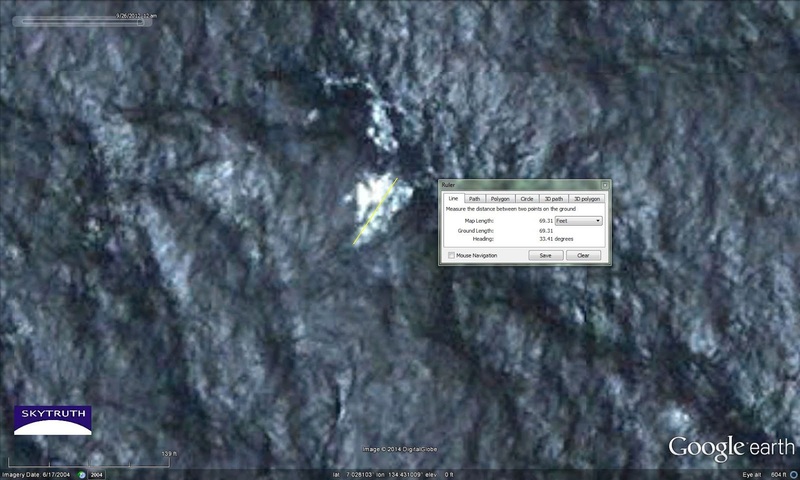 Without access to the raw, full-resolution image data, I had no idea how the images had been processed. The Thai satellite images in particular were contrast-enhanced so severely that all shades of gray had been reduced to simple black-and-white, eliminating many of the visual clues that could help an experienced analyst. 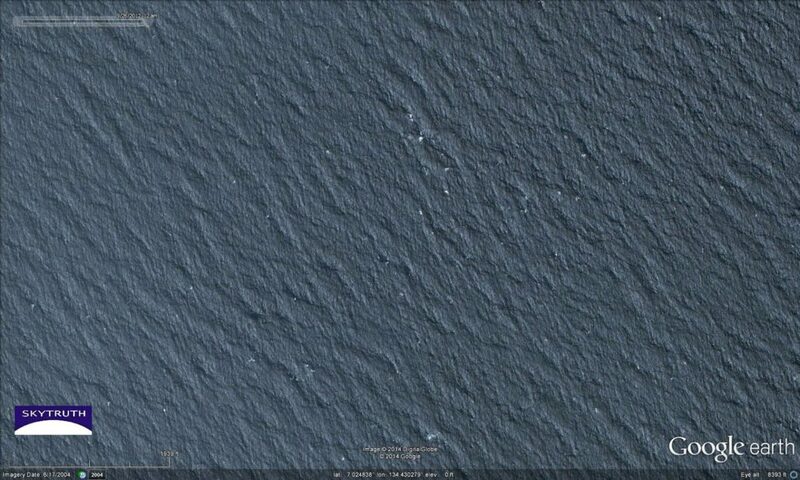 Talking-head “experts” on cable TV repeatedly claimed with absolute certainty that these images showed debris. If you ever stare at the ocean from the window of a jet at 35,000 feet, you’ll notice white patches of various size and shape that randomly seemed to appear out of nowhere, slowly get brighter, then slowly fade away. It’s mesmerizing, and kind of beautiful. You’re looking at sunglint as the faces of waves momentarily line up to send a mirror-like reflection of the sun your way; and possibly you’re seeing whitecaps, generated by the wind occasionally blowing the tops off the steepest waves. The rougher the sea-state, the more of these bright patches you’ll see. Stephen Wood, a former CIA analyst and satellite imagery expert, said the satellites could be seeing something as simple as whitecaps, which he said can look deceptively like solid objects. I don’t mean to say neener-neener to my fellow image analysts in Australia, Thailand and China. I still don’t have the images they had, so who knows — some of that stuff really might have been wreckage, floating trash, discarded fishing gear, or something else. There’s a lot going on out there in the big ocean. 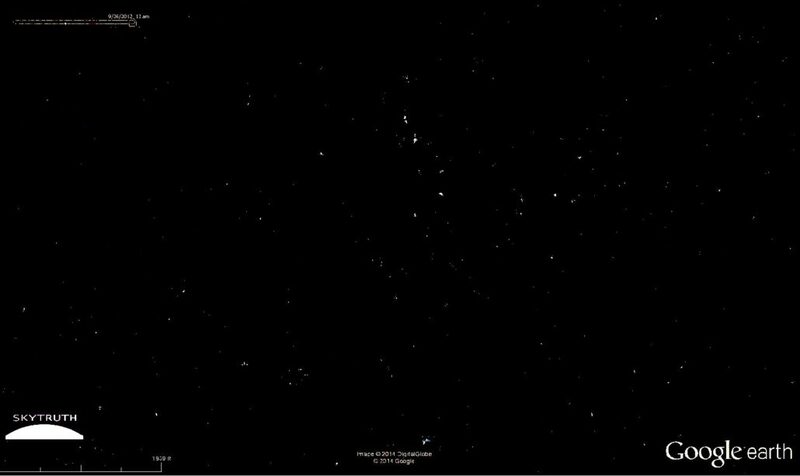 We rushed to our own conclusions in the heat of the moment with the low-resolution imagery that was publicly available (here and here). And who knows what careful caveats and cautions those analysts provided with their work, that got tossed aside by their superiors or the media in the furious grinding rush to be The First to find the missing airplane? But I think this is a tragic example of how easy it is to see whatever we want to see, and hear whatever we want to hear, when we’re confronted with a confusing mashup of noise, inconclusive data, and life-or-death urgency. My sincere condolences to the friends and family of those who are still missing. This week for throwback Thursday (#TBT) we’re going deep into Friday Night Lights territory and checking out the landscape of West Texas. 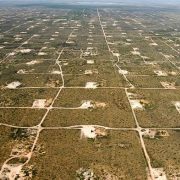 We’re looking at the area around Midland and Odessa to see how fracking in the Permian Basin has triggered a new oil boom that has transformed the region in recent years. The Google-powered Timelapse shows the surge of oil and natural gas extraction in this region. As of today, there are 546 drilling rigs working the Permian shale formations – over a third of all onshore drilling rigs pursuing oil in the US. Do some skytruthing of your own by zooming in or out of the Timelapse. 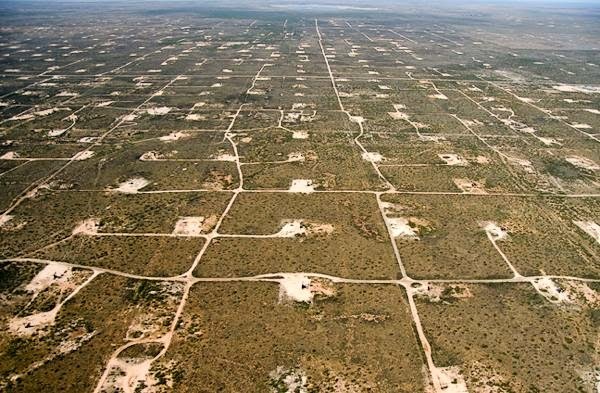 If you’re interested in more Texas viewing, check out the Yates Oil Field in Pecos County (which is west-southwest of this view). Take a screenshot and let us know what you find via Facebook and Twitter. [May 15, 2014 – Shepherdstown, WV] SkyTruth continues our appeal to the Bureau of Land Management and other federal officials to ensure that where drilling occurs on public lands, operators must fully disclose the chemicals used in the hydraulic fracturing process in a manner consistent with the Obama Administration’s Open Data policy. The Bureau of Land Management is in the final stages of preparing a rule to govern fracking operations on over 750 million acres of federal and Indian lands, but we are concerned that even though early indications suggest that BLM will require disclosure of the chemicals used, they will relegate this important responsibility to FracFocus, an industry-funded data repository that is not compliant with federal standards for transparency and accessibility. SkyTruth has written about this issue before on our blog, given invited testimony before Congress, met with BLM officials, and even released our own machine-readable database from FracFocus recordsuntil our efforts were blocked by the site’s operators due to indiscriminate throttling of access to the chemical disclosure reports. Read the full letter below. This week for throwback thursday (#TBT) we’re setting our sites on the Brahmaputra River in India. We’re checking out the river around Assam and seeing how it shifts and changes over the years. 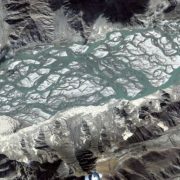 This 1,800 mile long river begins as snowfall in the Himalayas and is a prime example of a braided river. As you can see from the google-powered Timelapse, the Brahmaputra River is made up of many small channels and bars that meander and change over time due to all the sediment eroding and washing down from the mountains. Plus the amount of water flowing in the river is constantly changing based on how much snow and ice is melting. The amount of meltwater, of course, depends on the season and time of day making for a very wide and unpredictable waterway. Do some skytruthing your own– zoom in or out of the Timelapse to see how the braids change and weave over time. And look around the globe for other rivers draining uplifing mountain ranges. 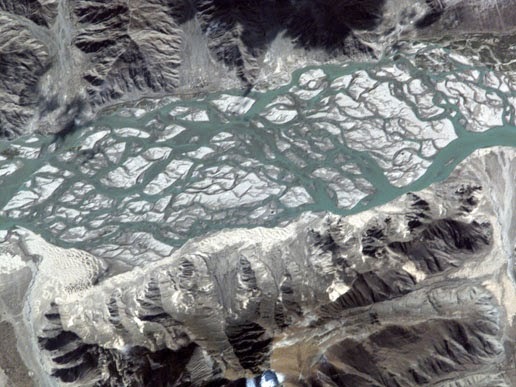 What is the most interesting braided river you can find? Take a screenshot and tell us on Facebook or Twitter!